The past few years have seen an influx of ideas related to generating renewable energy coming to market. However, only a few of them have shown the capability to suffice the contemporary needs of green energy. One such innovative and highly useful technology is the generation of energy by mixing of sea water and fresh water. The place where a river runs into the sea is an excellent location, wherein a large amount of energy is released because of the difference in salt concentrations between the two types of waters. This method of generating renewable energy was originally discovered in 1970 in order to curb world power crisis, however due to lack of technological means the idea couldn’t be explored. The technology is based on the concept of osmosis. Energy is acquired due to the difference in salt concentration between sea and river water. The concept is based on the term salinity gradient power that helps in generating renewable energy without the release of carbon dioxide. There are mainly two types of methods that are used to generate energy in this way– the electro dialysis method and pressure retarded osmosis method. The arrangement consists of a chamber that is divided into two parts with the help of a membrane, which is also the heart of the system. One part of the chamber is fed with fresh water and the other with sea water. The water might be pumped through out the system using booster pumps. It is imperative that the water supplied is clean and thus water filters are provided at the entrance of the feed line. Moreover, the membrane installed is of special a type which allows it to follow PRO (Pressure Retarded Osmosis), the method generally used for generating energy using this concept. The outlet from the sea water side goes to the turbine assembly and rotates the turbine, producing power which is supplied to the grid. A part of the outlet goes to the pressure exchanger to keep the system constantly pressurised. The System works on the principle of osmotic pressure, utilising entropy and mixing the two different salt gradients. Just as sea water can be converted to fresh water by adding energy to the former, in the same way energy can also be produced by mixing sea and fresh water. In this process, the water with low salt gradient, fresh water side moves to the side having higher salt gradient, the sea water. This movement leads to an increase in pressure on the sea water side because of the osmotic forces generated with the help of a membrane, thus leading to Pressure Retarded Osmosis. It has been found that more than half of theoretical energy can be transformed to usable energy using this process. Also, it is to note that more the salt gradient difference, higher the generation of osmotic pressure and more is the energy produced. 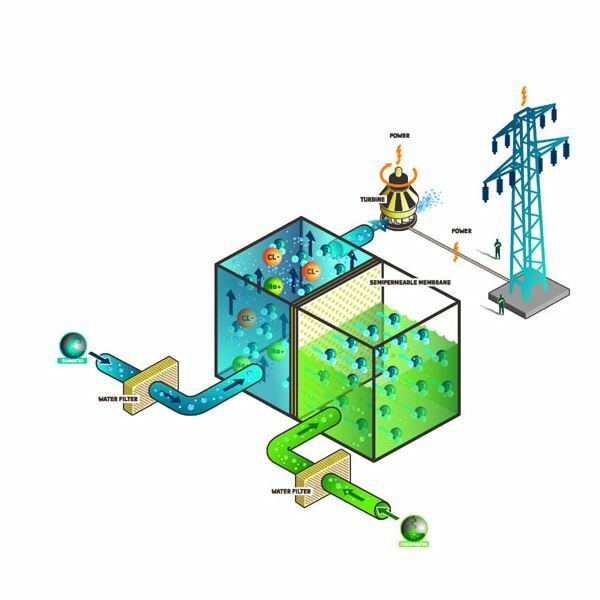 The system is an efficient means of generating electricity without leaving any carbon foot prints. Moreover, Norway’s research organisation SINTEF is working with the power company Statkraft, which has already installed two small scale fully functional plants and is presently working on a bigger plant to boost the production. The Norwegian plant pressurizes both fresh water and salt water through membranes into a water tight chamber. The fresh water passes through the membranes and mixes with the pressurized sea water. The mixture of sea and fresh water then flows out of the chamber under high pressure into a hydropower turbine that converts the pressure into mechanical work.